The first wave of 7.3 million homeowners who lost their home to foreclosure or short sale during the foreclosure crisis in 2015 are now past the seven-year window they conservatively need to repair their credit and qualify to buy a home. More waves of these potential boomerang buyers will be moving past that seven-year window over the next eight years corresponding to the eight years of above-normal foreclosure activity from 2007 to 2014. 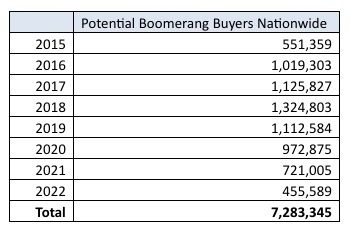 Here’s how those emerging boomerang buyers break down by year.